Blueberry Lemonade Cocktail, light and refreshing vodka cocktail, a beautiful signature drink for parties! 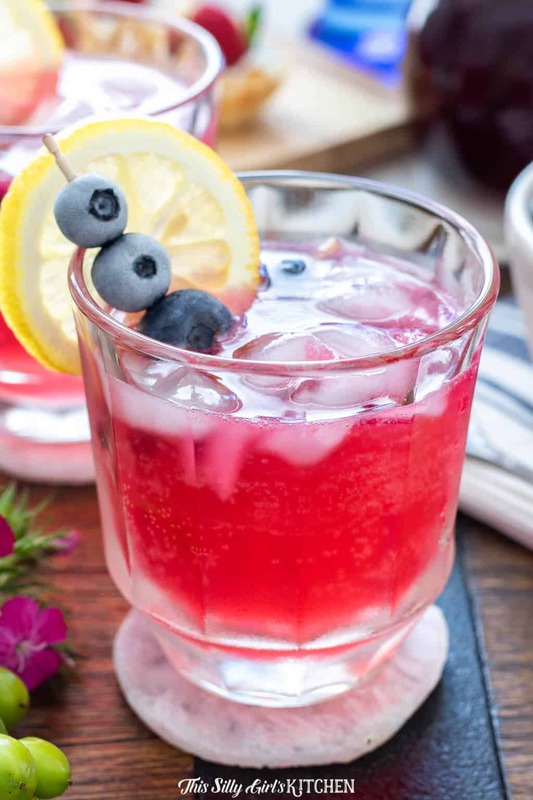 Blueberry simple syrup, fresh lemon juice, citrus soda, and vodka are all you need for this blueberry lemonade cocktail! 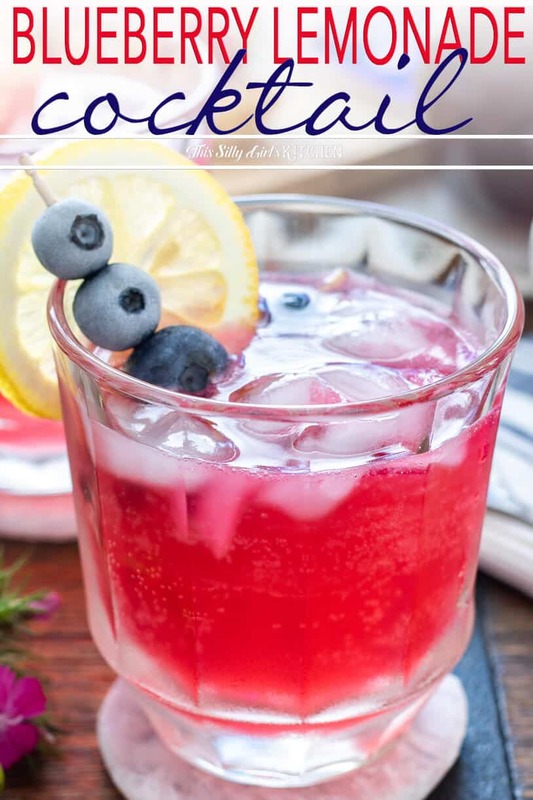 I just can’t get over how beautiful this blueberry lemonade cocktail came out – and so easy too! Vodka, in general, is by far my favorite type of alcohol. It just mixes so well with any type of soda or juice. 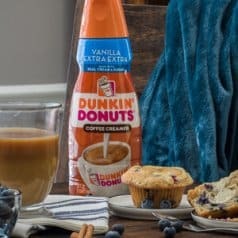 I tend to lean towards using it in cocktails so the flavor of the alcohol won’t try to compete with the other flavors of the drink. And, believe me, you will want to savor this blueberry lemonade cocktail to the very last sip. What is really extra special about Pinnacle® Original Vodka is the combination of quality and value you get from the brand. 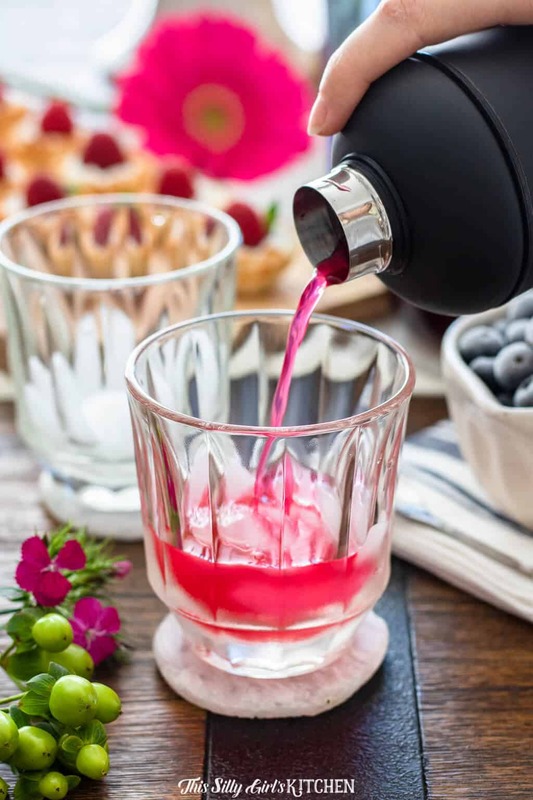 It has been my go-to vodka this summer for everyday cocktails and gatherings. Pinnacle® sent me a bunch of fun French themed goodies and I couldn’t wait to show everything off this past weekend with my girlfriends. I have always been drawn to French culture. I think this is because of their food. French cuisine played a HUGE impact on how we all cook today. That’s it! It was just an afternoon gathering, so I wasn’t serving a full meal. 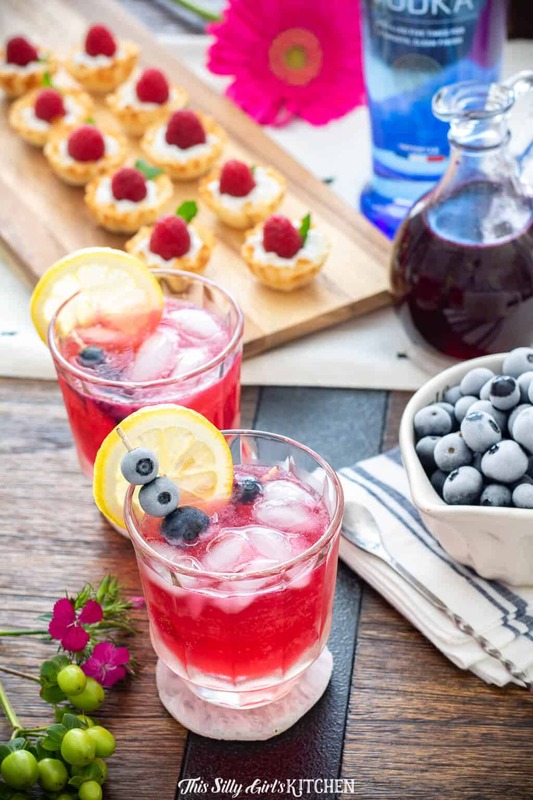 Just a fun little catch-up session with some nibbles and my signature drink for the afternoon – Blueberry Lemonade Cocktails! Not every “party” has to be over the top. Having it in the afternoon can save a lot of time and hassle and lets you enjoy your event. The items I made were easy to assemble, and I was able to prepare aspects of each one ahead of time. I made the lemon scented stabilized whipped cream for the raspberry cups the night before. Since the whipped cream is stabilized, it will hold through the night, just whip it a touch right before assembling the cups and you’re good to go. The blueberry simple syrup was made the day before as well. The blueberry garnishes were put in the freezer the night before. Prepping for the gathering only took me about 20 minutes, but having that free time to spend with my friends really helped out a lot. One thing I am big on is having fresh flowers on the table. They just help make your home more inviting and livens the place up a bit. I made sure to purchase flowers that I knew would go with the overall theme of the party. 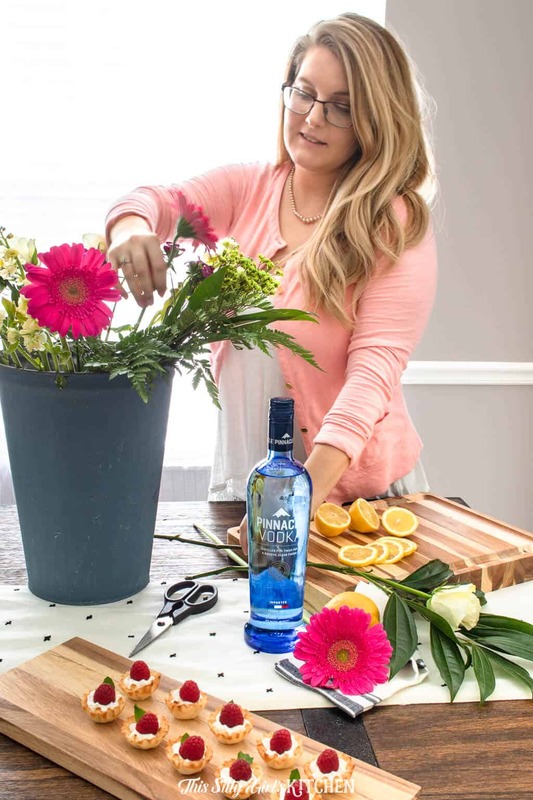 My blueberry lemonade cocktails are this gorgeous vibrant fuchsia, so I got Gerber daisies to match! Another tip is to freeze berries. 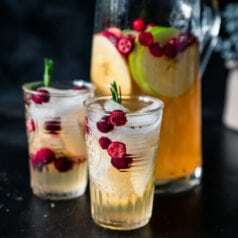 This makes for a fun drink garnish that helps keep beverages cold and makes for a yummy snack as well. The afternoon went by super fast, but it was fun to catch up. I got several requests for the cocktail recipe! Score, that means my work here is done, LOL! With a few of my simple entertaining tips, I hope you feel inspired to throw your own French-themed soiree! 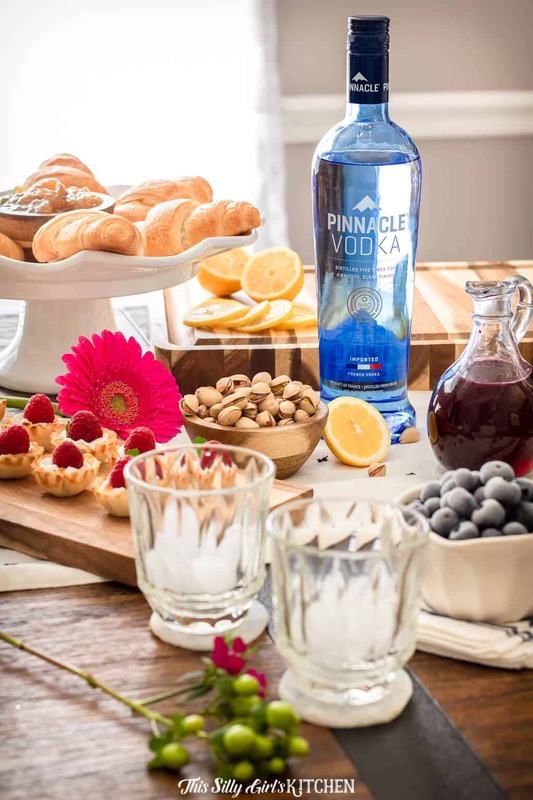 Check out Pinnacle® Vodka’s website to see where you can buy Pinnacle Original – vodka made with French Ingredients near you. 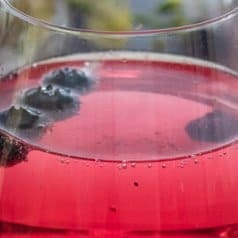 Blueberry Lemonade Cocktail, a light and refreshing vodka cocktail, a beautiful signature drink for parties! 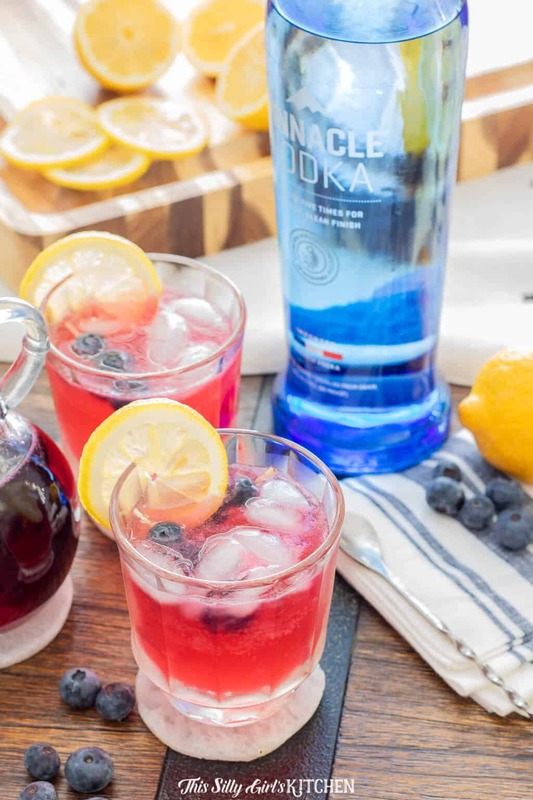 Blueberry simple syrup, fresh lemon juice, citrus soda, and vodka is all you need for this blueberry lemonade cocktail! Place simple syrup, lemon juice, and vodka into a shaker (or pour directly into two glasses). Shake until combined, pour half the mixture over ice in two glasses. Top each glass with 1/2 cup of the soda, stir to combine. Garnish with frozen blueberries and lemon, optional.